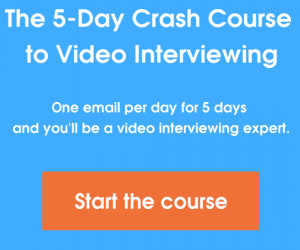 Spark Hire offers cost-effective video interviews. After all, a major benefit of video interviewing is saving money so we want you to be able to afford integrating video interviewing into your hiring process. The technology requirements aren’t strenuous either. All you need is a webcam (which is a standard feature on computers these days) to connect with candidates in a live interview. If you’re looking to review candidate video responses to your interview questions, you just need a web browser and an Internet connection! It doesn’t get any simpler than that. On the contrary, video interviews and online recruiting have made life easier than ever for job seekers. Video interviews allow candidates to learn valuable information about your company from the comfort of their own home. One-way video interviews also allow candidates to provide answers to your interview questions on their own time, in a less stressful environment. Less stress and less travel? What’s not to like? The numbers say otherwise. 53% of HR managers in an Office Team survey reported using video interviews “very often” during their recruiting processes in 2012. That’s up from 1% in 2011. That is a huge increase! While video interviews will never replace a final, in-person interview—they’re not intended to—video interviews and online recruiting do streamline the recruiting process as a whole. Screen your candidates more carefully with video interviews, and feel safe about inviting fewer candidates to your offices. Did you know that an HR professional can review 10 one-way video interviews in the time it takes to conduct 1 phone interview? Bad hires can cost 1/3 of their annual salary to replace. Luckily, video interviews can prevent a bad hire from ever coming into your organization because they allow multiple encounters with a candidate’s personality, body languages, and interpersonal skills much earlier in the hiring process. Don’t risk making a bad hire by avoiding video interviews. Have an excuse for avoiding video interviews? See if you can stump us by leaving a comment, below (bet you can’t! ).